More than 78,254,799 beer lovers served! Wanted to let you know that Pend Oreille entered its first judging-U.S. Brewers Assoc "Best in the West" and won a Gold for Idaho Pale Ale, and a Bronze for Scottish Ale (2 barleywines won gold and silver). We're still having lotsa fun with this, workin hard and drinking loads of good beer. 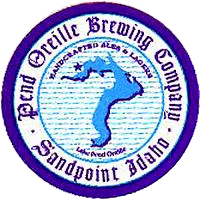 Pend Oreille Brewing Company has concluded the planning process for bottling its IPA, HooDoo Porter, Rapid Lightning Red, Campbell’s Crest Scottish Ale, and City Beach Blonde Pilsner. The new packages will be widely available to consumers in Washington, Montana, and Idaho in January, 1998.The 12 oz. Heritage bottles are available in six pack carriers, enclosed in corrugated case boxes. "Initial roll out for the five brands has begun," says Chris Campbell, President of the company, "with 4,000 cases going to distributors in Idaho and Montana. Eastern Washington will roll out on January 10." Brewery and pub closed October 1, 2001. It was a wild ride!